We've all seen the news. The tragic events in Haiti have moved us to help. We've all seen the news. The tragic events in Haiti have moved us to help. Judaism values saving lives (pikuach nefesh) before nearly everything. Accordingly, we've transformed what was to be our Tu B'Shvat event this Sunday into a way to raise some money for Haiti disaster relief. Instead of celebrating ecology and the New Year of the Trees, we'll be contributing toward helping to save lives. Either way its Tikkun Olam and we hope you join us. It's the same talent, the same venue, and the same price, just a different aim- albeit one that's equally Jewish. Partial proceeds from the event will be donated to JUF's Haitian Earthquake Relief Fund, which is funneling funds to Joint Distribution Committee and IsraAID, both on the ground in Haiti. We hope to see you Sunday and that you will invite your friends. 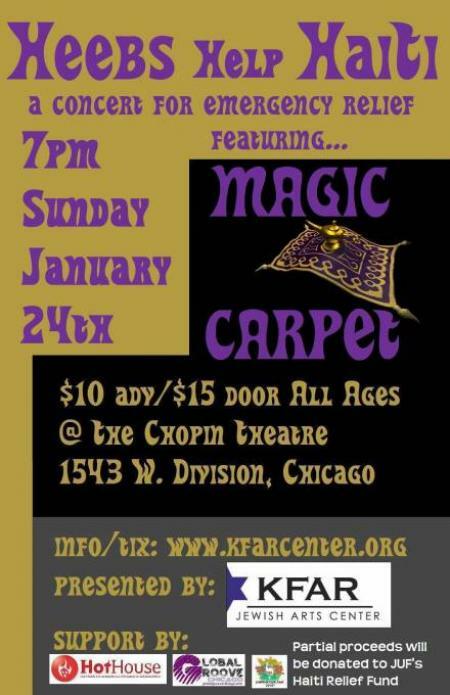 Magic Carpet honors ancient music while taking a bold step into the future. Transcending geographical boundaries, this music group takes the audience on an exhilarating ride through time and space. With the vibrations of Jazz, Reggae, and Funk, blended with the traditions of Africa, the Middle East, and India, Magic Carpet embarks on a spiritual journey every time they take off. Its member musicians are also teachers who excavate the history of music and the connection between ancient cultures to promote the similarities of people through the context of music. They weave traditional rhythms, North African and Middle Eastern maqams, East African pentatonic scales, Indian ragas, Western Jazz modes and improvisation into the tapestry of Magic Carpet.